Fighting game matches can come in many forms, from quick blowouts to drawn-out bouts, but one Japanese arcade has introduced something quite unique, holding tournaments for the game Galaxy Fight in which the rounds last only two seconds each. Mikado, located in the Tokyo neighborhood of Takadanobaba, is holy ground for fighting game fans. With its long rows of head-to-head cabinets, the unassuming game center is the perfect place for competition. Its schedule is filled with regular events for everything from modern titles like Guilty Gear Xrd and Ultra Street Fighter IV to classics such as Vampire Savior and Samurai Shodown. That said, more obscure games are typically the focus at Mikado, and nowhere is this more apparent than during the arcade’s Street Fighter Carnival events. Despite the name, these competitions feature a variety of franchises, allowing even the most niche titles to share the spotlight. Galaxy Fight is one such game. 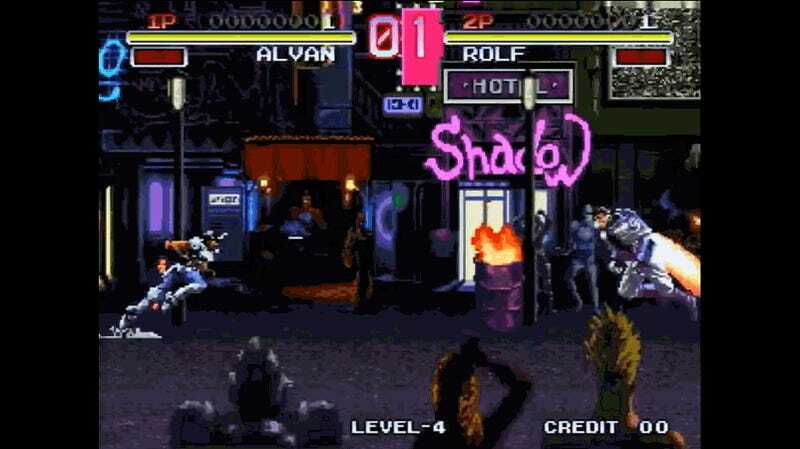 Developed by Sunsoft for the Neo Geo, the fighter’s unique sci-fi trappings helped it stand out at least to some extent during the 1990s’ explosion of Street Fighter clones. The use of infinite-scrolling stages without the usual invisible boundaries forced players to pursue their opponent, making matches fairly offense-oriented. Over the last few years, Mikado has included Galaxy Fight in two separate Street Fighter Carnival circuits. Unlike the other chosen games, however, this one had a special caveat: Where most competitive fighting game rounds are played with 99 ticks on the clock, the Galaxy Fight machines started with just :01 on the timer. You’d think such a thing wouldn’t work, and yet it seems to have distilled the intense mind games associated with the fighting game genre to their purest form, crafting a unique experience for players and spectators alike. Strategy that typically plays out over a minute and a half is crammed into just a few brief moments. Should you wait for your opponent to make the first move and react accordingly, or bet everything on a risky uppercut that can be punished if it misses? With such a small amount of time for gameplay, the weakest attack can secure a round, opening avenues for outlandish tactics that infrequently pop up during normal competition. After introducing the concept in August 2014, the folks at Mikado have run one-second Galaxy Fight tournaments regularly, as recently as last year. The game center plans to include one-second Galaxy Fight and this special format during Street Fighter Carnival IX later this year. You can replicate this setting at home, if you have the right version of the game. The Arcade Archives release of Galaxy Fight on PlayStation 4 and Xbox One also allows players to reduce the round time to just one second, making it quite possibly the perfect ice-breaker to introduce fighting game-averse friends to the appeals of the genre. Brian Ashcraft contributed reporting to this story.